Animals handle the harsh winter months in different ways. While some move to warmer climates, others sleep the winter away. 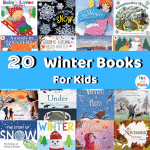 To help kids understand how animals deal with the winter, these bear hibernation books focus on bears and other animals that hibernate for kids. 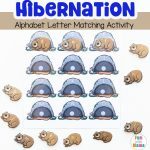 Check out our fun hibernation activities for preschoolers and alphabet letter matching hibernation activity. Bear Snores On was written by Karma Wilson and illustrated by Jane Chapman. As Bear hibernates for the winter, a variety of animals find shelter in his cave. They make a fire, eat some food and have a party all while he sleeps. When he wakes up, he’s sad to see that he missed all the fun! The flowing rhyme keeps the attention of young readers and it is accompanied by beautiful illustrations. Shh! Bears Sleeping was written by David Martin and illustrated by Steve Johnson and Lou Fancher. Follow a Mama Black Bear and her cubs as they go through a year of seasonal changes. The short rhyming text is full of action and puts the focus on the beautiful oil painted illustrations of the bears. Old Bear was written and illustrated by Kevin Henkes. Join the adorable Old Bear as he hibernates for winter, but dreams about life as a cub experiencing all the seasons. The sweet bear and easy text will make this fun for kids to read over and over again. Snow Rabbit, Spring Rabbit: A Book of Changing Seasons was written by Il Sung Na. This bright and colorful story introduces readers to the many ways that animals prepare for the winter. The simple text explores the ideas of migration, hibernation and warm winter coats. The simple text and whimsical illustrations will capture the attention of even the youngest readers. Sleep Tight Little Bear by Britta Teckentrup is an endearing story of Little Bear and his mother as they prepare for hibernation. They wander through the forest saying goodnight to their animal friends, and Little Bear is reassured that they will be looking out for him while he sleeps. The sweet story is accompanied by brightly colored mixed-media illustrations which kids will enjoy exploring. Animals in Winter (Let’s-Read-and-Find-Out Science) was written by Henrietta Bancroft and Richard G. Van Gelder and illustrated by Helen K. Davie. This book is a great introduction to what animals do while preparing for winter. While some animals migrate, others adapt to the changing season and hibernate. The illustrations show the actions of a variety of species, and the simple text is clear and full of information. Over and Under the Snow was written by Kate Messner and illustrated by Christoper Silas Neal. Explore the secret world of animals that live under the snow in the winter. The mixed media illustrations that accompany the simple story make the animals and people stand out from the stark white snow, and also show what is happening beneath the snow in the tunnels and spaces below. The author’s notes also include lots of detailed information about the wide variety of animals found in the book. Hibernation Station was written by Michelle Meadows and illustrated by Kurt Cyrus. This fun rhyming story follows a group of animals as they board a train and get ready to go to sleep for the winter. The gentle rhyme is paired with adorable illustrations showing the animals bundled up in pajamas and ready to be lulled to sleep. The story not only teaches about hibernation, but also makes a soothing bedtime story. A Bed for Bear was written and illustrated by Clive McFarland. This sweet story follows a little bear who decides that the bear den is too crowded to sleep in. He goes on a journey to find a new place to hibernate. After trying out some of his friend’s beds, he finds the perfect place to spend the winter. Kids will love the adorable bear character and the funny situations he finds himself in. The Animals’ Winter Sleep was written by Lynda Graham-Barber and illustrated by Nancy Carol Willis. This beautifully illustrated book introduces young readers to the hibernation and winter adaption skills of a variety of animals. The simple rhyming text makes this a soothing read aloud for bedtime, while the detailed illustrations will keep kids intrigued. Time to Sleep (An Owlet Book) was written and illustrated by Denise Fleming. This brightly colored book follows a group of woodland animals as they pass along the exciting news that winter is coming. Each animal puts off going to sleep until they tell the next animal about the change in seasons (which parents will recognize from putting stubborn kids to bed!). The text provides information about the winter habits of the various animals, and it is accompanied by vivid illustrations. Bear Has a Story to Tell was written by Philip C. Stead and illustrated by Erin E. Stead. Follow Bear as he tries to find an animal friend that he can share his story with. Each of his friends is preparing for winter, and Bear lends a helping hand. Once everyone is settled for winter, he realizes he will have to wait to share his story. The beautifully delicate illustrations and the sweet story touch on hibernation, migration and winter preparations, while also telling a story of friendship and patience. Are You Sure, Mother Bear? was written by Amy Hest and illustrated by Lauren Tobia. This sweet story follows Little Miss Bear and her mother as they prepare to sleep for winter. Little Miss can’t sleep because she is worried about missing all of her favorite things. Mother Bear reassures her that everything she loves will be there when they wake in the spring. The sweet connection between the mother and child makes this a great bedtime story to share. This is an adorable bear hibernation book. Frederick by Leo Lionni tells the story of a little mouse named Frederick, who chooses to prepare for winter a little differently than other mice. While the rest of the mice are gathering food, Frederick is memorizing the sights, smells and warmth around him. When the dreary winter days are upon them, Frederick the poet saves the day with his words and memories. It is a sweet story that reminds us that everyone can contribute to them team in their own way. Sleep, Big Bear, Sleep! was written by Maureen Wright and illustrated by Will Hillenbrand. This story follows a bear who is hard of hearing as Old Man Winter tries to tell him that it is time to hibernate. Kids will enjoy the hilarious ways that Big Bear misinterprets the message over and over again, and wears himself out just in time for winter. The funny story and illustrations are sure to have kids laughing. Groundhog Stays Up Late was written by Margery Cuyler and illustrated by Jean Cassels. When winter comes, Groundhog decides that he doesn’t want to hibernate this year, even though his friends warn him that he should. When he wakes them up for an early spring, they are not happy with him. This fun story is accompanied by vibrant illustrations of the animal friends. Scholastic Reader Level 2: Hibernation was written by Tori Kosara. 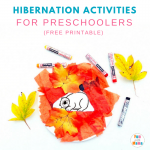 This nonfiction book explores the topic of hibernation by introducing kids to various animals. The bright and clear photographs show these animals as they prepare for winter and sleep in their habitats. The animals are clearly labeled and the fairly simple text is full of information. The book also contains a glossary of vocabulary words, which are highlighted throughout the book and paired with the proper pronunciation. A Bed For The Winter, Level 1: Beginning to Read by Karen Wallace uses simple text and large photographs to explore the winter homes of a variety of animals. The text is full of interesting facts, and the close up photos of the animals show a lot of detail. The book includes a picture word list that introduces readers to the names of animal homes. What Is Hibernation? (The Science of Living Things) by John Crossingham and Bobbie Kalman is a great nonfiction text for teaching kids about hibernation. This book includes information on a variety of animals, as well as the problems they may face during hibernation. The text is accompanied by clear photographs of the animals, and full of vocabulary words. It includes simple animals that hibernate for kids facts. National Geographic Readers: Sleep, Bear! by Shelby Alinsky follows a bear as they prepare for winter, hibernate, and wake up searching for food. The simple text and large, bright photographs make this an enticing book for young readers to read on their own. The book also includes a vocabulary tree, as well as an extension activity to bring the reader into the story. 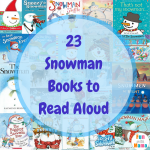 You found a lot of fun books on hibernation! Thank you for sharing.